A small fishing village backed by impressive sand dunes and red sandstone cliffs, Canoa Quebrada entices a growing number of foreign visitors with its near-perfect tropical weather and sun-kissed beaches. 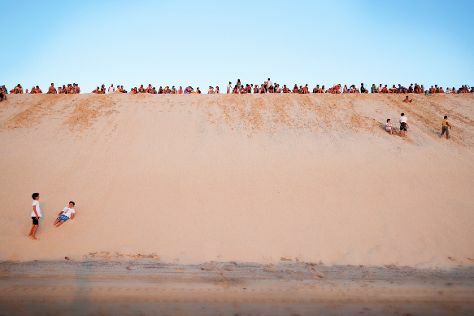 Kick off your visit on the 27th (Sat): kick back and relax at Praia de Canoa Quebrada, then kick back and relax at Ceara Beach, and then explore the striking landscape at Por-do-Sol Dune. 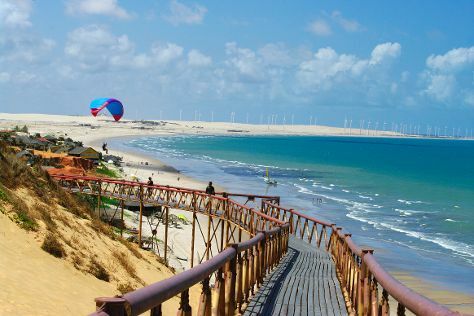 Keep things going the next day: head outdoors with Parapente Canoa Quebrada, take a stroll through Vila do Estevao, then don't miss a visit to Aldeia de pescadores, and finally don't miss a visit to Broadway de Canoa Quebrada. To see more things to do, ratings, where to stay, and tourist information, you can read our Canoa Quebrada trip planner . The Route module shows you travel options from your home to Canoa Quebrada. In July, daytime highs in Canoa Quebrada are 40°C, while nighttime lows are 30°C. Finish your sightseeing early on the 29th (Mon) to allow enough time to drive to Fortaleza. Take a break from Fortaleza with a short trip to Beach Park in Aquiraz, about 46 minutes away. There's lots more to do: kick back and relax at Morro Branco, tour the pleasant surroundings at Iracema Beach, explore and take pictures at Arena Castelao, and take in the architecture and atmosphere at Metropolitana Cathedral. To see ratings, reviews, where to stay, and more tourist information, refer to the Fortaleza travel planner. Traveling by car from Canoa Quebrada to Fortaleza takes 2.5 hours. Alternatively, you can take a bus. Traveling from Canoa Quebrada in July, expect nights in Fortaleza to be about the same, around 27°C, while days are a bit cooler, around 34°C. On the 1st (Thu), you'll have the morning to explore before heading off to Jericoacoara. Jericoacoara is known for nature, beaches, adventure, historic sites, and nightlife. Your plan includes some of its best attractions: explore the activities along Lagoa do Paraiso, make a trip to Arvore da Preguica, enjoy the sand and surf at Jericoacoara Beach, and explore the striking landscape at Duna do Por do Sol. To see traveler tips, more things to do, ratings, and other tourist information, go to the Jericoacoara route planner . Getting from Fortaleza to Jericoacoara by shuttle takes about 4 hours. Other options: drive; or do a combination of bus and taxi. Due to the time zone difference, you'll gain 1 hour traveling from Fortaleza to Jericoacoara. Finish up your sightseeing early on the 4th (Sun) so you can travel to Lencois Maranhenses National Park. On the 5th (Mon), tour the pleasant surroundings at Capivara Beach and then contemplate the waterfront views at Lagoa da Esperanca. For reviews, other places to visit, photos, and more tourist information, refer to the Lencois Maranhenses National Park travel itinerary planner . Explore your travel options from Jericoacoara to Lencois Maranhenses National Park with the Route module. The time zone difference when traveling from Jericoacoara to Lencois Maranhenses National Park is 1 hour. In August in Lencois Maranhenses National Park, expect temperatures between 37°C during the day and 29°C at night. You will leave for home on the 6th (Tue).